Last time I alluded to one of the annoying things about a February marathon. Here’s the other, more serious one: the weather. I live in Washington DC, not northern Minnesota, so I can’t complain. Or rather, I shouldn’t. But I’m going to anyway. Because I had my biggest, most important workout scheduled for the weekend Snowzilla decided to invade the East Coast. Yea, it's pretty... but it's not all about looks, people. 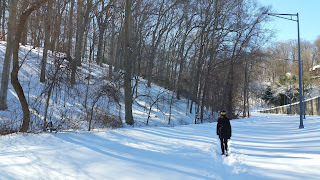 I rearranged all my workouts, moving my last big workout (a long run with most of the miles at goal marathon pace) from Sunday to Friday (pre-Snowzilla attack). I figured, after my big workout, I’d be content and relieved to be on the treadmill the rest of the weekend, glad to be done with the monster workout before the monster snowstorm. Except the content feeling never came, because Friday’s workout went terribly. It was slow—way too slow. I ran a loop I have always hated (Hains Point) because my go to route (Beach Drive) is only open to runners on weekends. The wind seemed brutal, my gels were solid rocks, and my stomach didn’t want to handle anything. But those excuses don’t seem to justify why it went so poorly. I was desperately trying to talk myself back into it, to not be negative, to put the last bad mile behind me and try to get back on a reasonable pace for the next one, but nothing seemed to be working. My legs just would not go faster. 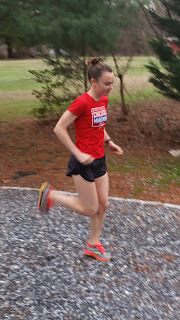 The redeeming quality of multiple Hains Point loops was that Kerry had again offered to help out, and she could jump in for a mile here and there. And once again, I owe her eight zillion thank yous. I wanted to give up. Brutally. Alright, running demons, you win, I’m done. I knew I shouldn’t give up on the workout—even though I was going WAY too slowly—because I needed to get in a workout somehow. There’s no making up this one (we’re too close to the race and now all the roads are covered in snow), so slow was better than nothing. I knew that and kept reminding myself of it, but it didn’t matter. It was Kerry’s presence—and her bright vest coming around the bend like a neon angel—that made me not. When the struggle fest was over and I finally warmed up inside, it seemed all hope had been sucked out of me, by the wind, by the demons, by my evil watch for telling me splits I didn’t care to see. 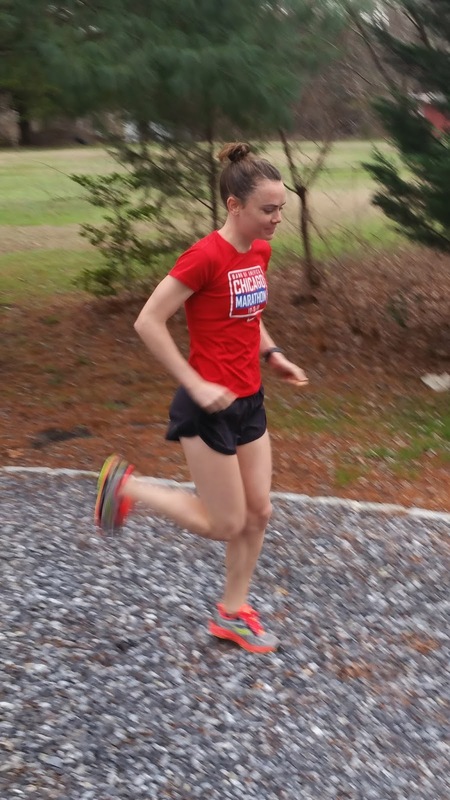 I wanted to run much faster for this workout; I wanted to prove to myself that my goal pace for the marathon is possible. If I hit it in this workout I’d be ready, just like before CIM. Once again, I needed proof I wasn’t being bat$#*! crazy about my goals. But this was slower than the marathon pace workout I did over Christmas, which I also declared as too slow at the time. 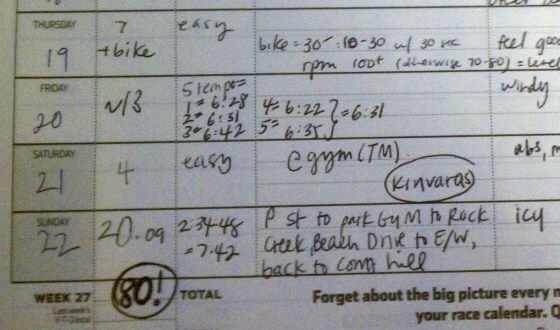 And it was slower than this workout pre-CIM. I started to think I’m being completely nuts. I’ve actually adjusted my outlandish goals from the beginning of the season to be ever so slightly more realistic, and now even those seem entirely delusional. I started thinking about all the people who warned me to just to enjoy the LA race, not put too much pressure on myself, not go for some crazy goal only to end up upset. That approach isn’t me, but during and after this workout, giving in suddenly seemed logical and inevitable. Maybe I shouldn’t be going for a PR; I’m not in shape to anyway. Why stress about it? Man, the demons know exactly what to say to bring you down. I know my goals aren’t always rational or logical, but going for them anyway is what I love to do. I remember this same workout from last season. It also went poorly, only much, much more so. (In fact, every marathon pace workout from that season was a disaster.) I didn’t have time to complain about it, because I ended up hurt instead, but I do remember the day after that terrible workout I was talking myself back into believing my ridiculous goal was still possible. I had less to go on then. Where did that Teal go? And how do I get her back? After spending the remainder of Friday in a total I Hate Running Funk, I woke up Saturday and tried to find a glimmer of hope, a small piece of evidence, that I’m not crazy to still chase my ambitious goal. For starters, I am in better shape than ever before. I can’t base everything on one workout; everyone has bad days. The rest of this season’s workouts (and the half) have been slightly faster than past seasons. So that’s good. 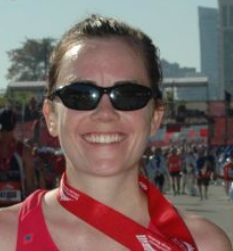 Before the season I ran CIM, I rarely (i.e. never) hit marathon pace in workouts. I almost always ran faster on race day. (Boston 2014 is the only exception.) Also, my workouts where I tried to hit goal pace used to be shorter than they are now. So I had much farther to go on race day and I still ran faster. Part of me feels like that was another lifetime ago. That was some other Runner Teal—can I really still do that? But part of the reason I was super bummed after Friday’s workout was that it drained some of the Trials excitement out of me. 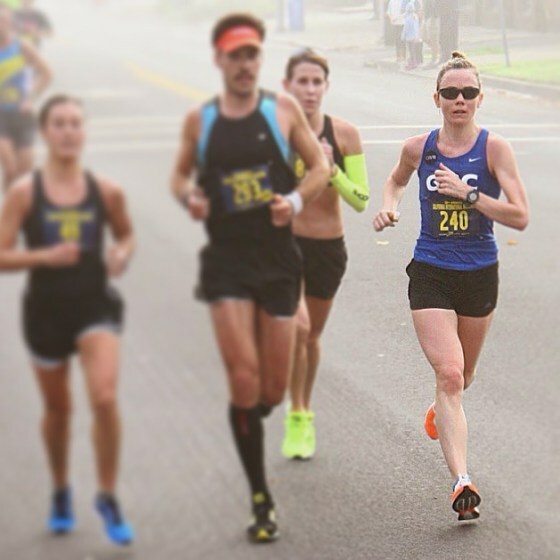 Listen, I’m a running super nerd: I am so excited to line up with my idols, I can’t wait to see the men speed by me, or to get a live account of the women’s race as we do our out and backs on Figueroa St. I am still beyond thrilled to be invited. BUT I’m also excited to race myself—literally, to race against myself—and to try to get this big PR I’ve been dreaming of. When I think it might not be possible or that I shouldn’t go for it, I get really bummed and it steals some excitement from the whole enterprise. Because no matter what those demons are trying to tell me, I really do want to go for it. Snowzilla dumped its snow and moved on, up the East Coast. Yet it continues in my head. I got walloped with two feet worth of cold reality this weekend, and I still feel like I’m sitting in a blizzard of negativity and reasons to give up. But I have a little morsel of hope, providing just a little light and warmth: I’ve run faster in races than in practice before. It’s years old and fading fast… but I’m clinging to it, as the storm rages on. P.S.- Gratitude update: I’m still healthy. At this point last time I was dealing with a season-ending injury, but so far I've made it through, into the taper, in one piece. And that is HUGE. So no matter my mental demons, I’m incredibly grateful for that. BREAKING NEWS: The Olympic trials are in one month. 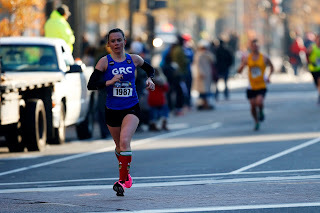 The fact that time is passing first dawned on me this past weekend, when I realized with a start complete shock minor panic attack that the race was five weeks away. Five weeks! I typically taper for three weeks, which means two measly weeks left of real training. The Holy Crap/How Is This Marathon Sneaking Up So Fast feeling is pretty typical, for me at least. You’re in the thick of training, la de dah, it seems like you have so many more workouts and weeks left and then… all of sudden the race is upon you. But this season feels worse. Maybe because it’s the biggest race of my life, or because things were a bit wonky at the beginning, or maybe the holidays being smack in middle of things threw me off. I still got in all my workouts, but it wasn’t my usual routine. I haven’t been on the track with the GRC girls in what seems like forever. And the race is in a month??? Of course my main freak out is because I don’t feel ready. I want more time—more weeks of big mileage, more long runs, more of everything. Surely I could be faster and nail my goals if I had just a little more time?? That’s pretty normal, too. I’m feeling particularly out of sorts this season, like things just aren’t going quite right, but I think I feel that way every season. It’s easy to look back fondly on seasons that ended well as if everything went smoothly; all the doubts and fears seem forgotten when the PRs happen. If only I could get back the confidence I had during my best season… But the grass is always greener on the other side; I wasn’t brimming with confidence back then either. Truthfully, the grass on both sides is full of doubts. But no matter how much I doubt myself or my preparation (Have I put in enough work? Will I be able to hit the pace I want? ), the reality is it’s better to be under trained than over trained. Over trained too easily becomes injury (and I’ll have none of that, please and thank you). But all this Only A Few Weeks Left business also makes me oddly sad. I love the training: the routine of it, the constant hum of tiredness, the endless peanut butter jars and banana bunches. Once the race gets closer (oh God, it’s going to get even closer?!) I’ll get the normal combo of super excited and intensely nervous, because of course I love racing, too. Until that happens, though, it’s a little sad the training part is ending. The realization of having only two big mileage weeks left has made me approach them with renewed vigor. I'm going to try to nail the last few workouts, obviously, but also work extra hard to do all the little things to take care of myself. After all, these are also the weeks everything fell apart last time, so despite my freaking out that I’m not ready, the priority needs to be on staying healthy. I PRed (officially, this time) in the 5k. I only run 5K PRs while wearing holiday socks. I baked (and ate) approximately 8 million Christmas cookies. At the end of the holidays, full of chocolate and miles, I flew to Jacksonville for a half marathon. The Jacksonville Bank Half Marathon is a generally low-key affair; without much prize money, it doesn’t tend to attract elite athletes. But this year, Richard Fannin (the elite coordinator for the Gate River Run) transformed it into THE place to go for a final chance at a Trials qualifier. (You can qualify for the marathon trials with a sub-1:15 half marathon.) He recruited around 100 elite and sub-elite athletes, a combination of athletes going for the standard and those that had previously qualified. 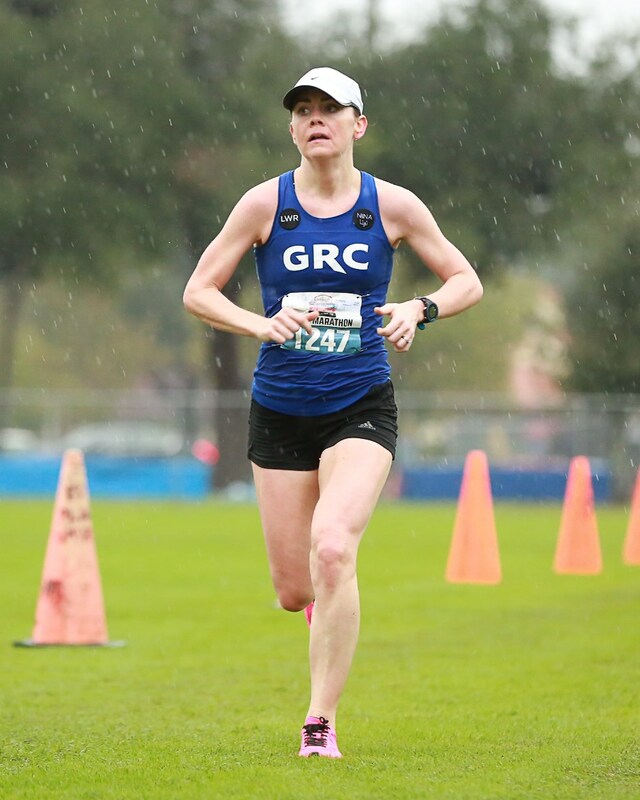 (On the women’s side, twenty women were going for the standard and twenty others, like me, had already qualified and were using the race as a tune-up/hard workout.) For those going for it, he put together pacers to take advantage of a pancake flat course and took care of every detail to make the experience seamless. 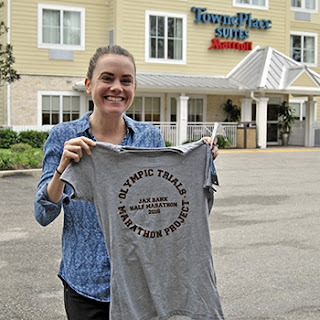 Each athlete (even the stars that were volunteering their pacing duties) paid their airfare, but Fannin hooked us all up with hotel rooms, coordinated rides to and from the airport, and rented out an entire restaurant for a massive pre-race pasta dinner. Check out their site for their awesome coverage of the race! I was thankful to be blessed enough to not have to attempt to run 1:15—the pressure was off for me—but I did want a big PR to give justification to the goals I’m shooting for in LA. I feel like I’ve had a half PR coming for a while; last season’s didn’t go so well. While my recent workouts have not hit my out-of-this-world ambitions, they are faster than they were in the fall of 2014 (when I set my current half PR). Doing some math based on comparing this season’s workouts to that season, I thought I was in shape to break 1:18. An ambitious, 90 second PR, but I’d take advantage of the elite treatment, the speedy field, and the pancake course. 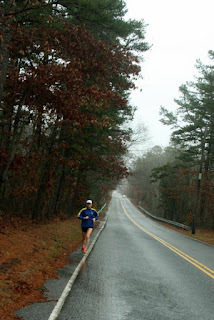 Race morning was dark and rainy, but that was better than heat by everyone’s accounts. My stomach was off from the minute I woke up, but I attributed it to nerves. When has my stomach ever been right on race morning? I hadn’t slept well, but when do I ever sleep well before races? These are normal race morning stresses, whatever. My race plan mainly consisted of NOT. STARTING. TOO. FAST. A large pack was going out at 1:15 pace (aka I-would-need-to-drop-out-by-mile-2 pace) so there was no way I could get sucked into that. I held back as people zipped by and it seemed quite a few other women had my plan, to relax and not go too crazy. After a mile or so, I found myself behind a group of three or four women, staying exactly the same distance behind them. Even though I wasn’t really with them, they helped keep me on pace. Remaining the same distance behind them seemed to be perfect. Through 5K and 10K, I was right on. There were moments of doubt (I can’t do this! I can’t keep up! I’m slowing!) but I kept reminding myself to be positive; I was doing exactly what I planned and I wasn’t slowing. Around mile 6, though, I caught the women, thereby losing my pacers. They must be slowing, but I’m feeling good! But when I saw the next split, I realized we were all slowing, and I only caught up because I was slowing slightly less. 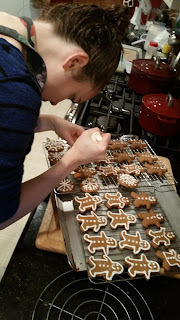 One woman came with me and encouraged me, “Let’s keep picking them off!” I was relieved to have someone to run with and kept working to stay with her. I was starting to struggle though. Our pace continued to slow, even though I felt like I was working to get it back and to stay with Encouraging Chick. Around mile 8, she gapped me. Looking back, I wish I had tried harder to stay with her, but that’s too easy to say after the fact. Why didn’t I just try harder?? Easier said than done. I told myself I could pick it up at mile 10. (Just 3 measly miles left!) I reminded myself I had successfully picked it up at the end of Raleigh. But not this time… my 11th and 12th miles were the slowest of the day. Somewhere in the 11th mile, all at once, I started hating the rain, realizing how much it sucked and how completely drenched I was. My shoes were soaked—I was carrying around my own little puddles to splash in every time I stepped down. With one mile left, I tried again to talk myself back into it: Pick it UP!! Almost done! 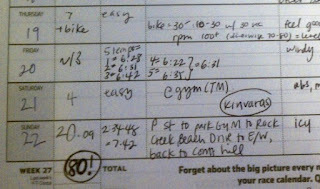 I started counting to myself (a strategy I often rely on during speedy track workouts). If I count to sixty six times, I’ll be done. (Not really, but close enough.) It at least worked to distract me, but my legs weren’t moving any faster. At last, I made the turn onto a grass field towards the finish on the track. Still I couldn’t find a sprint. As I finally made it around the bend of the track and saw the time on the clock, I realized how close I was to sneaking under 1:19. I pressed, but it didn’t seem enough. Afterwards, I went to the end of the track and let out some of my emotions. I wasn't sure of my official time but I knew that, while a PR (I know, I know! I’m the most ungrateful brat), it was at least a minute slower than I wanted to run. And that makes me seriously question my goal for the marathon. But I quickly felt stupid for being upset—there were people that had gone for the qualifier and missed it. My silly little goal and frustration (Just a PR? Who cares, no big deal, I want more!!) was nothing compared to their disappointment. Happily, seven women and twenty men did get their qualifier. Which is a HUGE amount when you think about how low-key this race was and is entirely due to Richard Fannin’s efforts. Thanks to him, and some seriously on-point pacers, a whole new flock of runners had their dreams come true. 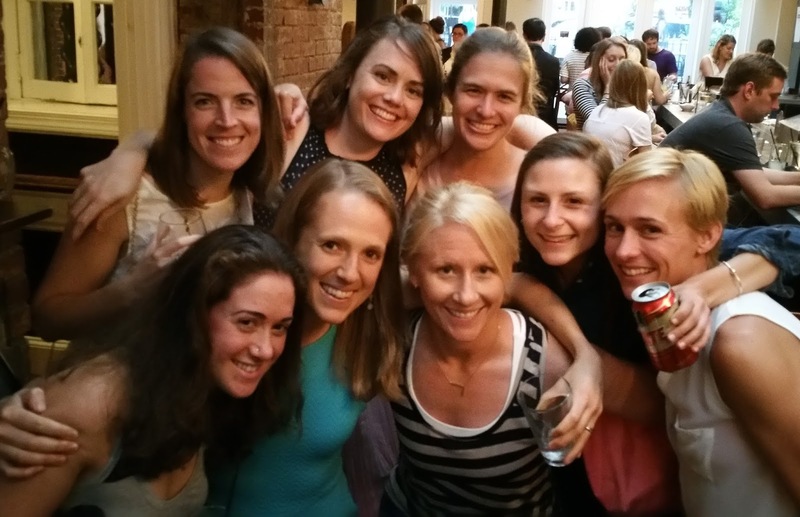 The whole weekend was full of a spirit of camaraderie—about people working together to go after a singular goal. It was awesome to be around that and the entire trip was unforgettable. But as I left the excitement of Jacksonville and headed home, my post-race grumpiness resumed. I wondered if I could blame the rain or my stomach (which was off for the entire day)… but there was no obvious scapegoat. I just didn’t have it. I still didn’t know my official time (there were some timing glitches due to the rain) but I lost any hope that I had broken 1:19. Monday afternoon, I finally found out I had officially run sub-1:19 (1:18:55 by chip time) which eased my disappointment a bit. 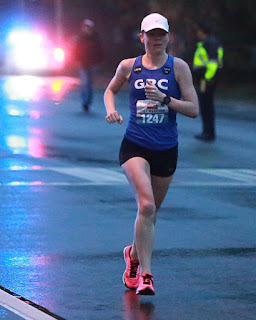 It’s still not the PR I hoped for, and the race caused some new doubts to sneak in, but it was a PR, so I’m trying to remind myself that I am running better than ever. (It seems obvious, but somehow I need to keep repeating this to myself.) Hopefully a few more weeks of hard work will bring my (as always) ambitious goals back into my grasp.